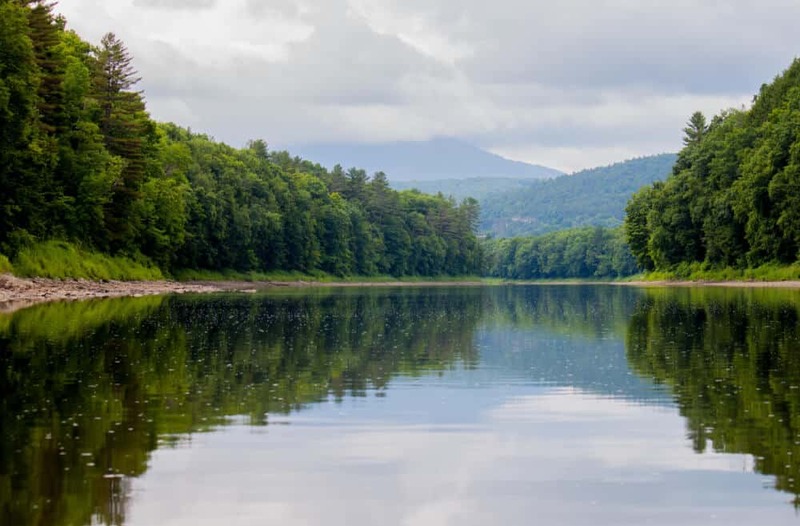 The Connecticut River meanders from north to south along the entire border between Vermont and New Hampshire for 235 miles. It’s New England’s largest and longest river, starting as a tiny pond in northern New Hampshire and journeying 410 miles to the sea via the Long Island Sound. 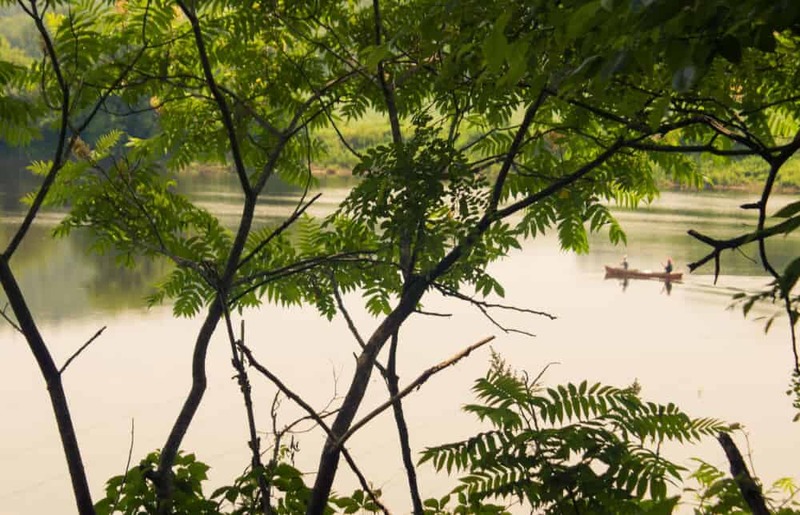 The Connecticut is a gentle river, beloved by paddlers of all abilities for its unspoiled shoreline, abundant wildlife, and ample public access points. It’s best explored by a canoe or kayak, which will allow you to coast along the shore looking for critters, take in the stunning views of the surrounding hills, and cool off with a swim whenever the mood strikes. 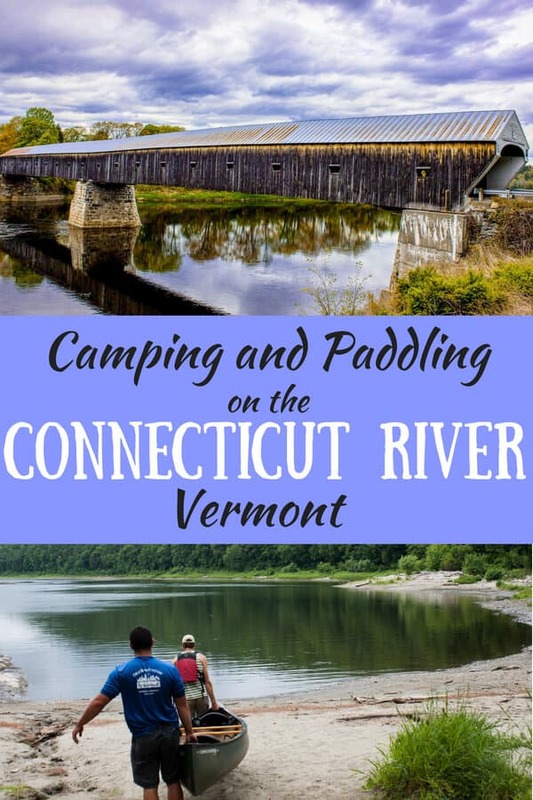 Not too long ago, we had the extreme pleasure of paddling 14 peaceful miles of the Connecticut River with Great River Outfitters — from Sumner Falls in Hartland, Vermont, to our campground at Wilgus State Park. It was a magical experience, and we’d love to share it with you. Our home base for our Connecticut River canoe trip was Wilgus State Park in Springfield, Vermont. 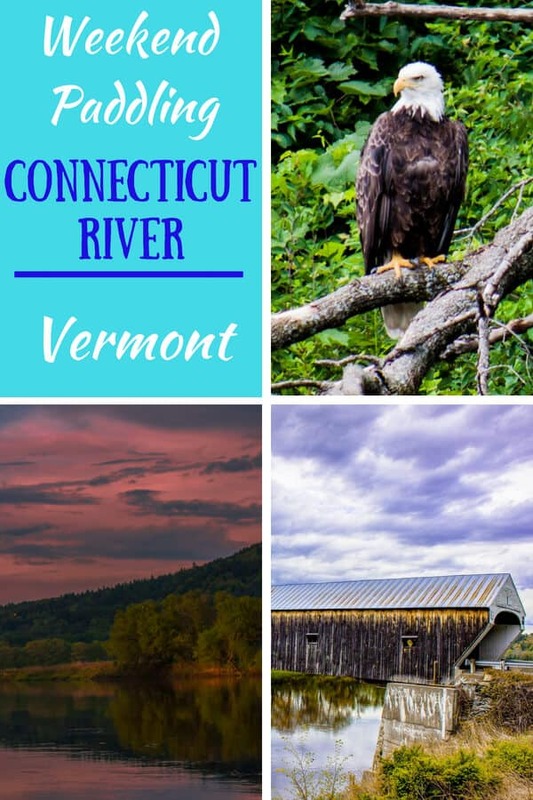 This is the only Vermont State Park that is right on the Connecticut River, and every one of the 21 campsites has a fabulous view of the water. You can choose from 15 tent/RV sites, 6 lean-tos, or 4 cabins. Our favorite site is #16, but I think the secret is out because it’s always booked when we try to reserve it. Don’t have your own boat? 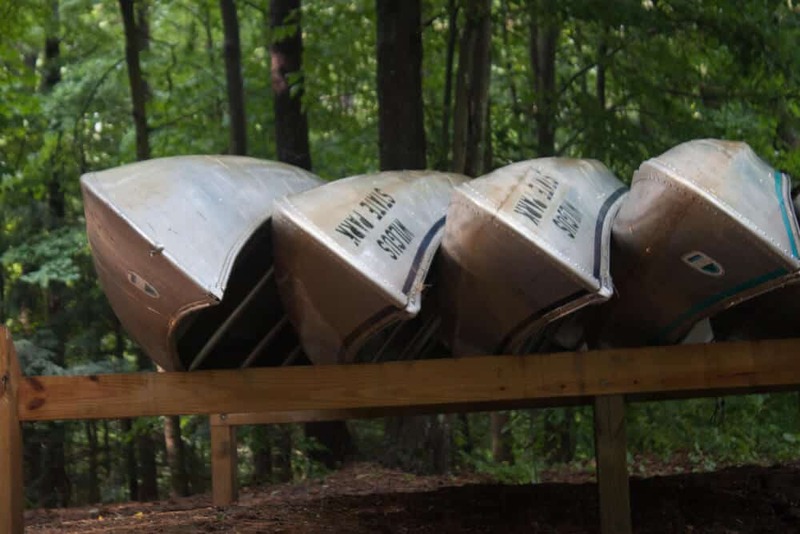 You can rent a canoe at Wilgus State Park. There’s a canoe/kayak launch in Wilgus State Park, WiFi at the contact station, and a mile-long nature trail across the road. You can rent canoes and kayaks at Wilgus State Park for a ½ or full day of paddling, or you can do what Eric and I did and embark on a full-day adventure on the river with Great River Outfitters. 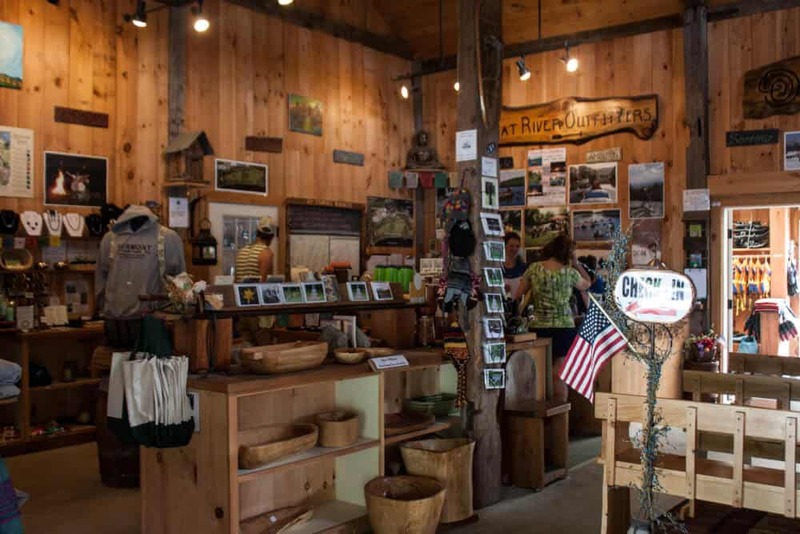 Great River Outfitters is located in Artisans Park in Windsor, Vermont. They’re a full-service outfitter, offering all kinds of adventures for all ages and abilities. Whether you’re looking for a mellow float trip on a raft, tube, canoe, or kayak, an outdoor leadership or survival course, or dog-sledding adventures in the winter, Great River Outfitters has you covered. The scope of their services is pretty impressive, and I won’t try to cover it all here, but check out their summer schedule for all the details. Whether you take a break from paddling to meander around the park, or you make a special trip to shop and explore, I highly recommend a visit to Artisans Park, and especially to Harpoon Brewery. Harpoon is based in Boston, but the Windsor brewery is a great little spot to relax with a craft beer and a sandwich. Tours of the brewery are offered on the weekends, and the pub is open daily for lunch and dinner. So, back to the paddling trip. Craig and Nicki from Great River Outfitters picked us up at Wilgus State Park at 9 am. We were the only ones taking advantage of the shuttle that day, but it’s a service they offer to campers on Wednesdays, Fridays, and Saturdays. We made our way north to Great River Outfitters, where we swapped the Subaru for a van and a trailer full of kayaks and canoes. While we waited for a few more paddlers, we had a chance to explore the store. When everything was set, Craig sat us down and gave us the low down on canoeing and kayaking the Connecticut River. He explained how to follow the channel (and the deepest water), where to spot wildlife, how high and fast the water was moving, and any weather precautions for the day. After our briefing, we loaded into the van. Eric and I were joined by a few more adventurers, including a feisty, kayaking dog named Baxter. The Great River Outfitter van transported us, along with our boats, to Sumner Falls in Hartland, Vermont, and within minutes we were in the water. Eric and I chose a canoe for our trip, so we could paddle together and carry a picnic and some photography gear, but many people kayak the Connecticut River, and most of the boats we spotted on our trip were kayaks. 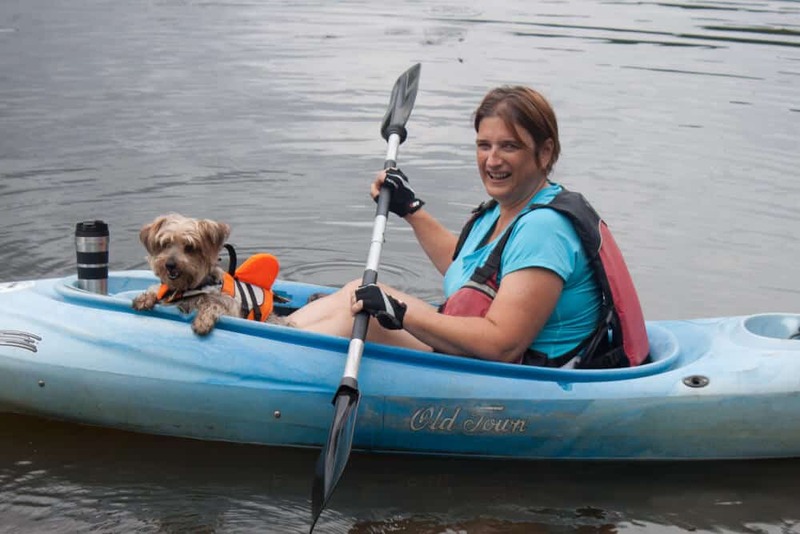 Dogs make great kayaking companions! The first five miles of our paddle were definitely the most scenic. We weren’t sure how long it would take to paddle 14 miles so we didn’t give this section the attention it deserved. My first tip for you is to enjoy this part of the river. You can easily paddle 14 miles in a day, even with stops for picnicking and swimming, so take your time! We spotted all kinds of birds, including common mergansers, black ducks with babies, two bald eagles, and dozens of kingfishers. Mt. Ascutney played hide and seek with us throughout our journey, making an appearance as we rounded a bend in the river, and then hiding behind the clouds when I pulled out my camera. Such is life. After paddling for about an hour and a half, we were back at Artisans Park, which sits right above the Connecticut River. Vigorous paddlers could probably complete this part in an hour. More leisurely floaters could stretch it to two or three hours, especially if you want to swim along the way. We cooled off in the river, pulled our canoe to shore, and then walked up to the Path of Life Garden for a picnic and a walk around the grounds. 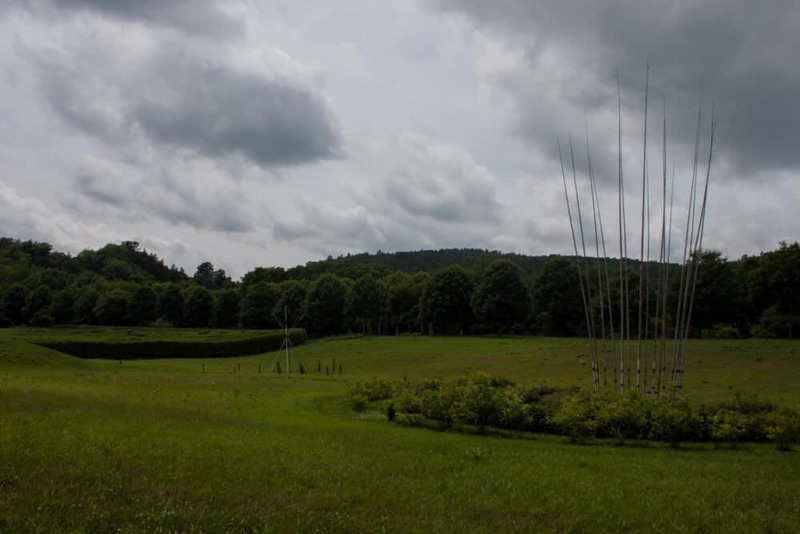 The Path of Life Garden is a beautiful, artistic journey from birth to death and beyond, spread out among 14 acres of pastoral land overlooking the river. 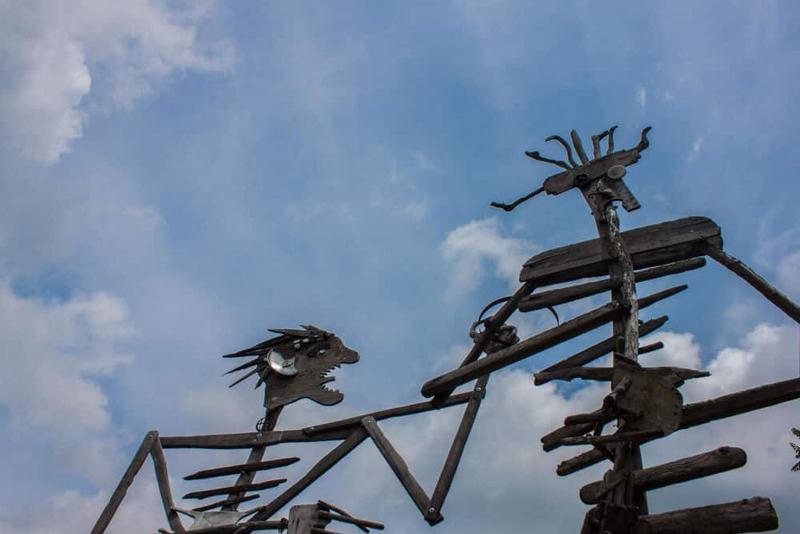 18 giant sculptures grace the grounds, all of them seamlessly integrated with the surrounding landscape. 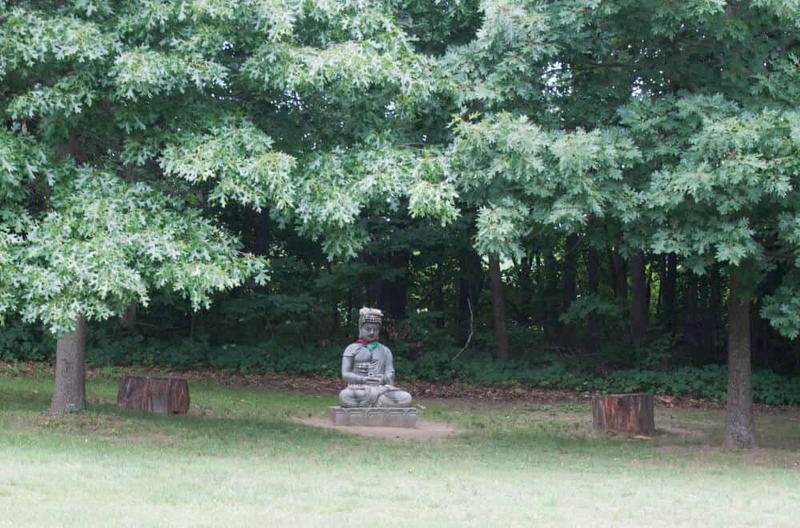 As we meandered from birth to death, we found numerous spots to relax, meditate, or just enjoy the surroundings. 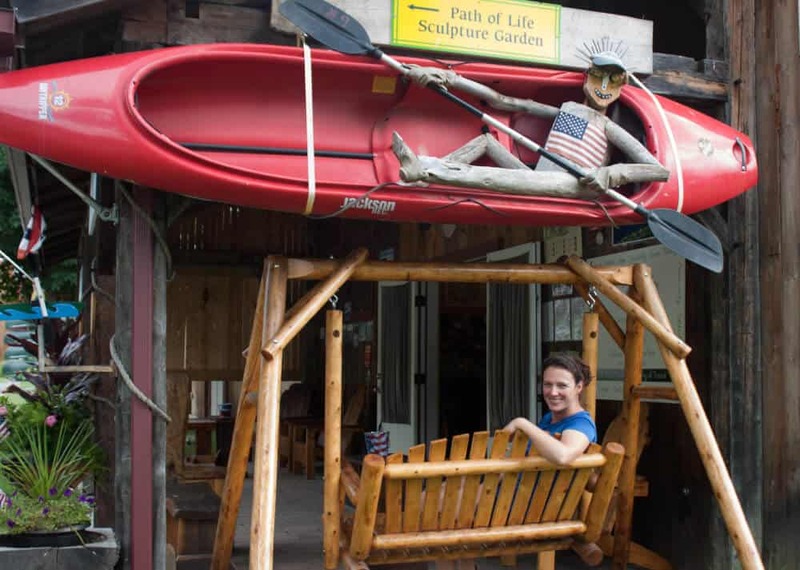 The Path of Life Gardens can be enjoyed as part of a float trip, or you can stop by Artisans Park for a self-guided tour. We had nine miles to cover before dinner at camp, so we picked up the pace a bit after leaving the Path of Life Garden. The next stretch of the Connecticut River was less wild, with a few houses peeking through the trees, and several paddlers sharing the afternoon with us. We were approaching the town of Windsor on the Vermont side, and Cornish on the New Hampshire side. 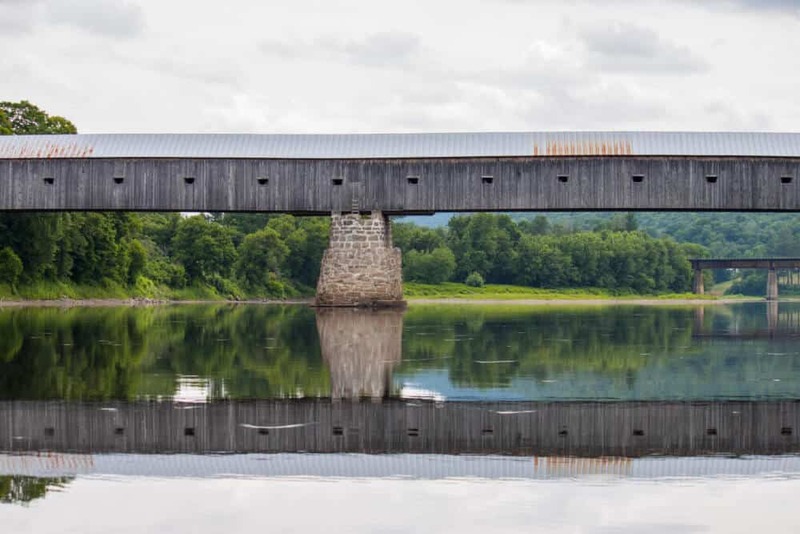 Aside from the majestic bald eagles, one of the highlights of our Connecticut River trip was paddling under and around the Cornish-Windsor Covered Bridge (or Windsor-Cornish Bridge depending on who you talk to). 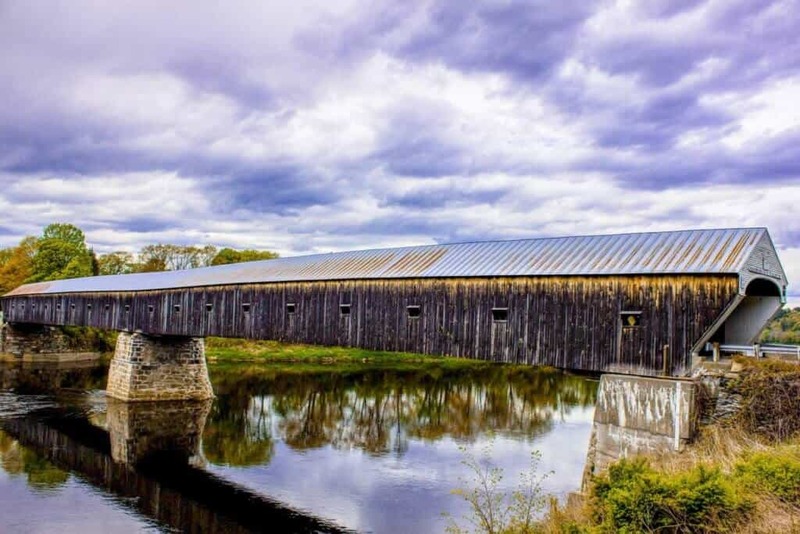 At 449.5′ long, the Cornish-Windsor Covered Bridge is the longest wooden covered bridge in Vermont and the longest two-span covered bridge in the world. New Hampshire actually owns the bridge, along with every other bridge connecting it with Vermont. In fact, New Hampshire owns the whole Connecticut River, all the way to the low-water mark on the western bank. I’ve explored a lot of covered bridges in Vermont (admittedly none in New Hampshire), and I think this one is the prettiest and the most unique. If you’re ever in the area, I urge you to walk across or paddle underneath. Just a few hours after passing under the Cornish-Windsor Covered Bridge, we were back at Wilgus State Park enjoying a cold beer, and a camp-cooked meal. Craig came with the van and trailer to pick up the boats, and we fell asleep blissfully tired under the light of a million stars. 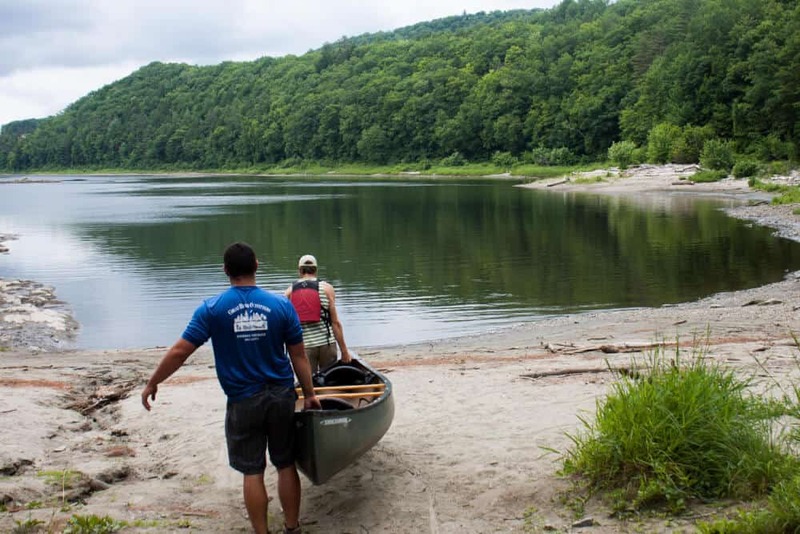 Wilgus State Park has partnered with Great River Outfitters to offer paddling trips down this beautiful stretch of the Connecticut River. 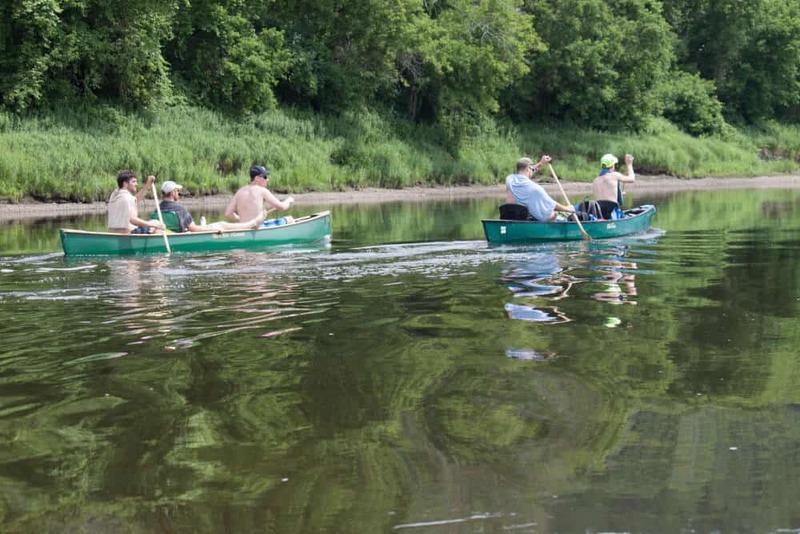 The beauty of these trips is that the folks from Great River Outfitters will pick you up at the park in the morning, outfit you with boats, paddles, and PFDs, and transport you to the river launch. All you have to do is float down the river to your campground. 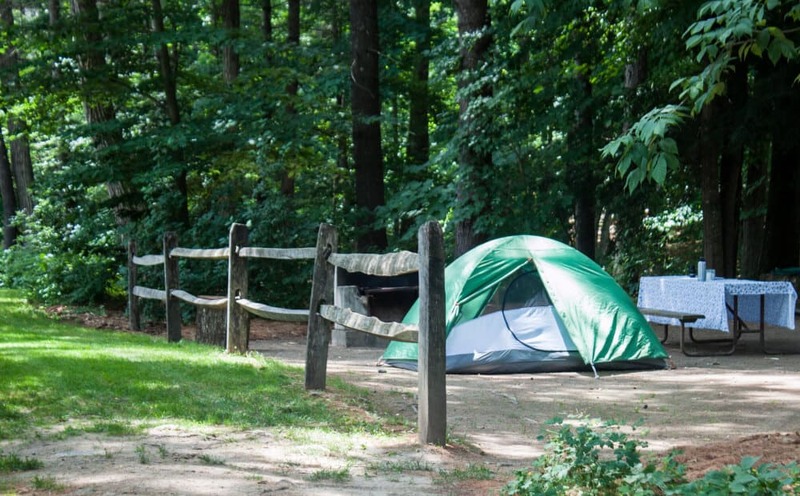 There are two trips available to campers at Wilgus State Park. The first is a 10-mile trip that begins at the Path of Life Gardens in Windsor and ends at Wilgus State Park. This should take a leisurely 6 to 8 hours to complete. The second trip, and the one we loved, starts in Sumner Falls for a 14-mile paddle back to the campground. The estimate for this trip is 8 to 10 hours, but we completed it in 7 without rushing. 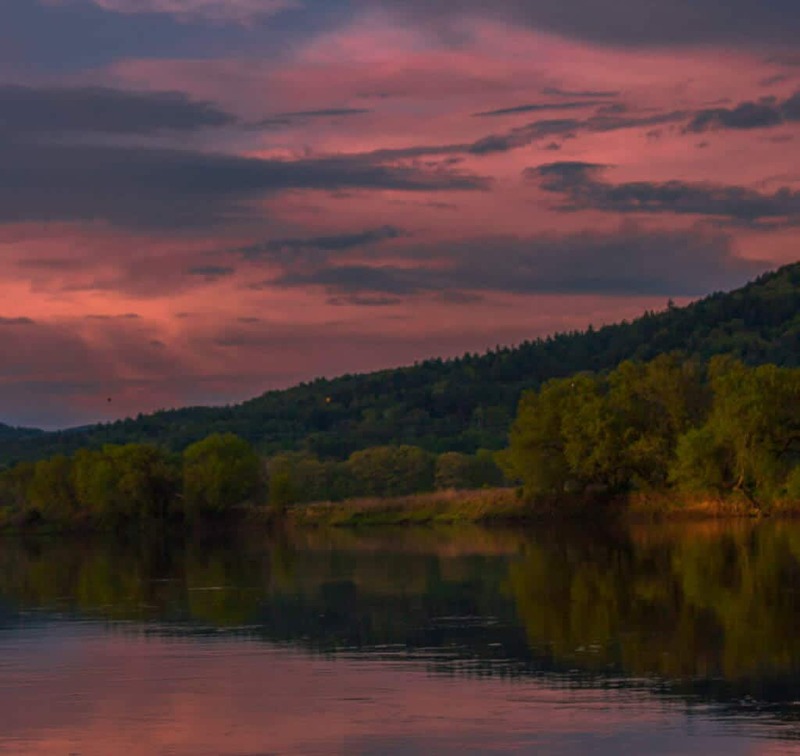 Want to plan your own float trip down this beautiful stretch of the Connecticut River? Here are some tips to make it happen. Reserve your campsite. Wilgus State Park has a pretty small campground. Make your reservations early to ensure you get a spot (remember – site #16). You can also rent one of four camping cabins if you aren’t into roughing it. Wilgus State Park is open from the end of April until Columbus Day weekend. It’s one of the first Vermont State Parks to open in the spring. Book your trip with Great River Outfitters. The shuttle service to Great River Outfitters runs on Wednesdays, Fridays, and Saturdays, departing at 9 am. You have to reserve a spot at the ranger station by 5 pm the day before your trip. Pack a picnic to enjoy on the river, or enjoy a meal and a beer at Harpoon Brewery in Artisans Park. Essentials for a summer float trip: sunglasses, sunblock, swimsuit, towel, hat, water shoes or sandals, cell phone, and a camera. We packed all of the above in a dry sack that we brought from home, but you can also buy a dry sack at the Great River Outfitters store. If you’re bringing a picnic (or lots of gear), I recommend renting a canoe, which holds more stuff. BYOB. Traveling with your own canoe or kayak? You can still take advantage of the shuttle service if you bring your own boat. 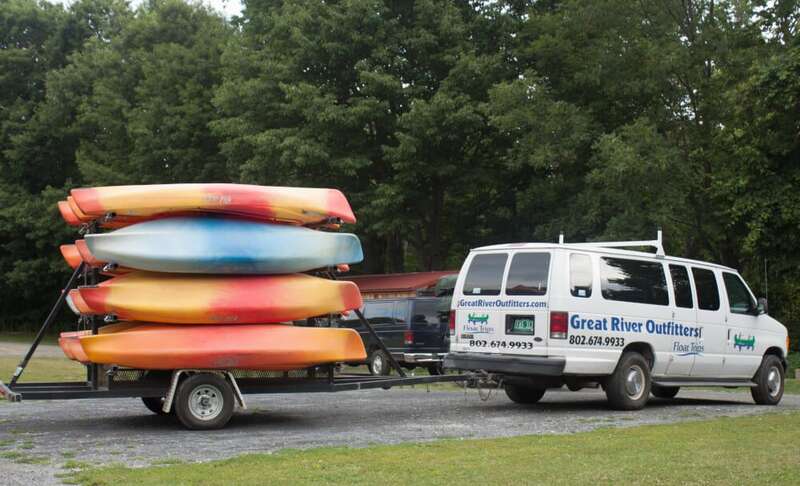 A huge thank you to Great River Outfitters for providing us with a complimentary canoe rental! We can’t wait to explore more of the Connecticut River! Thanks Tara; we love what you do. Thanks Tara, our time will be limited, but I’m understanding that the half-day Excursion starts above the bridge and only takes a few hours to get to wilgus. Is that correct? That’s correct. You can also rent boats at Wilgus, but you would have to paddle upstream to get to the bridge. It’s not a strong current, but definitely more fun to go down stream. Thanks for writing this blog Tara. My wife, brother and sister in law have reservations for Wilgus in a couple of weeks. It will be our base camp for our 4th covered bridge tour. My hope is that we can introduce our in laws to a paddling trip by going under the bridge. Wish is luck. I think you guys will enjoy Wilgus State Park. 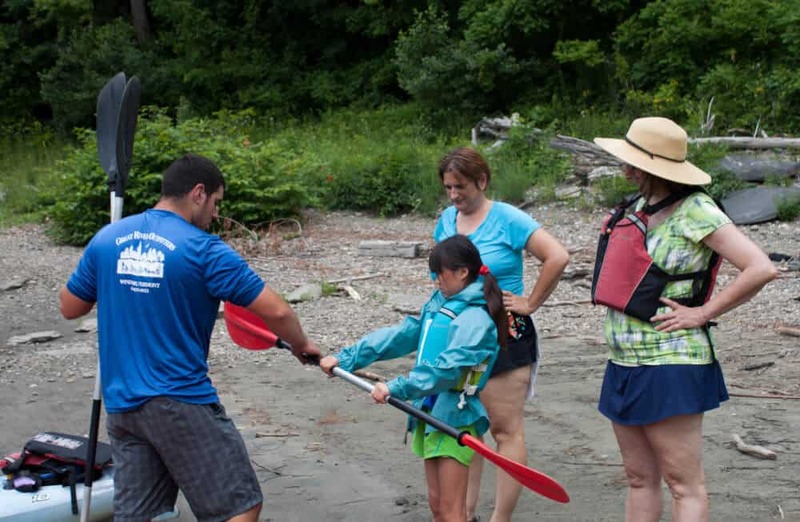 The paddling trip with Great River Outfitters is an easy one. If you have them pick you up and shuttle you upstream, you could literally not paddle at all and still make it back to camp in time for dinner. There are very few rapids, and the ones you do experience are very easy to manage. Also, the Cornish-Windsor bridge is my favorite!! King George III of England had established the border between Vermont and New Hampshire in 1764, and in 1935 the US Supreme Court re-affirmed King George s boundary as the low-water mark on the Vermont side of the river. Looks like a great place. The photo of the covered bridge with the reflection is cool. I would love to do that trip during the Fall, when all the leaves are changing. Definitely need to check out this part of the country. It looks so beautiful! With 14 miles its easy to get overwhelmed with the distance you have to cover and forget to enjoy the scenery like you mentioned – wonderful tip! I also really want to visit the Cornish-Windsor Bridge, its so different from anything we seen in this day and age. 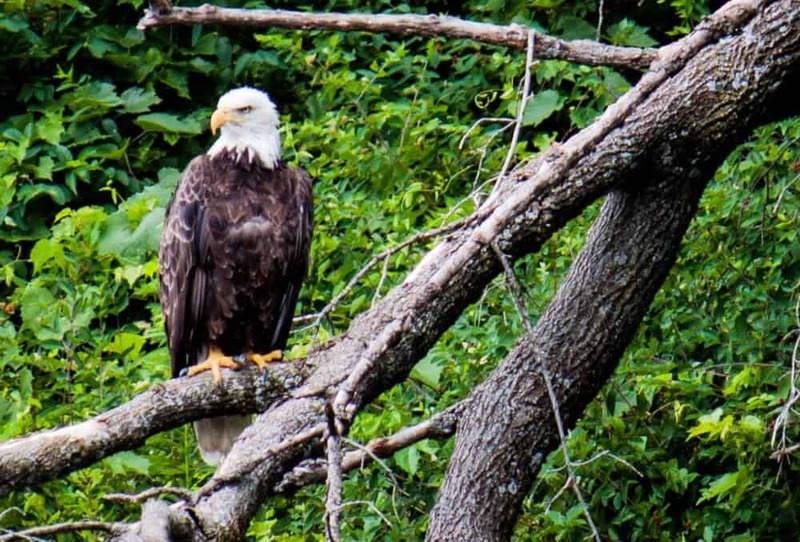 Wow that is such a great photo of the bald eagle! I’m loving your naturey and outdoorsy posts! Would love to hike and paddle here! What a trip! I love that you showed all of the highlights instead of just a main attraction! I would love to give this a shot myself! Thanks for sharing. That looks like an amazing trip! I’ve sadly never been camping because I don’t know how to drive. But I would love to see the covered bridge. It is really unique! The Path of Life Garden sounds beautiful as well. What a scenic adventure! I have canoed and kayaked previously but have never done one as long as this. I would definitely take my time to make sure that I finished. Also, there is so much beautiful nature to take in, definitely worth slowing down and pausing to appreciate it all. Thank you so much, Jo. I don’t consider myself a wildlife photographer, so it was a good thing it was sitting in a tree on the bank of the river. Easy-peasy! You guys have the best outdoor stories and adventures! Looks so serene. I’m actually camping this weekend and your post is definitely making me more excited about the upcoming trip. C’mon Heatless in Seattle, gimme some sun, please!!! Thanks for popping in, Hung. We’ve had a little too much sun and not enough rain. I’m sending some your way for your camping trip! This looks and sounds like so much fun. Beautiful photos! Gorgeous!!! The Path of Life Gardens is so cool – it looks like you had so much fun. That little puppy int he canoe certainly had a great time! It’s a sweet hidden destination, that garden, and exactly what we needed!